I am the most impatient person on the planet. No, really, that may seem like an exaggeration, but there are times in my life where I literally cannot wait for something to happen, even if it’s not able to be found on my grid yet. Graduation? Can’t wait. Getting a real job? Can’t wait! Finally getting to live on my own again? REALLY can’t wait. Marriage? Babies? Even though I know for a fact that I do not want these for quite a while (at least on the babies front), I CAN’T WAIT. All of these things have to happen and I want them to happen now. Which, I am just realizing, reminds me of Veruca Salt from Willy Wonka and the Chocolate Factory (I want it nooooooooow). That’s annoying…anywho, this impatience? It’s a problem. Each time I approach a new task in life, the thought hits me that I can’t wait for it to be done so I can go on to “a, b, or c”. What I really need to do is slow the hell down. Even though I can’t see it now, and even though it is EXTRAORDINARILY cliché, I know I’m missing out on so many things right this second, even if they are itty-bitty, miniscule, tiny details that I don’t think are important. Sitting down with a book and enjoying it? Totally worth it. Sitting down to read a book and stopping in the middle of it to daydream about the day I get to walk across the stage and get my diploma? Not so worth it. I can’t enjoy my last semester of undergraduate schooling (or my next two years of graduate school…) if I’m constantly thinking about May 10th, the day it finally happens. If I can’t focus on my day-to-day life, how can I really appreciate it? I find myself getting upset over small details of my life, and honestly, it is all moot. I get upset with Zach for not wanting to talk about the “M” word all the time. But why should I? I know how he feels about it, and I also know that he’s a guy, and he is most definitely not racing towards that finish line. He wants to be in my future, but he also wants to make sure that when it happens, we can LOVE it, not cram it in-between his job searches and my grad seminars. And to be honest? I should appreciate that. I do appreciate that, but I know that each time I throw a silly pity party, it undermines my appreciation and makes me look like a spoiled 10-year old in a chocolate factory begging for a goose. 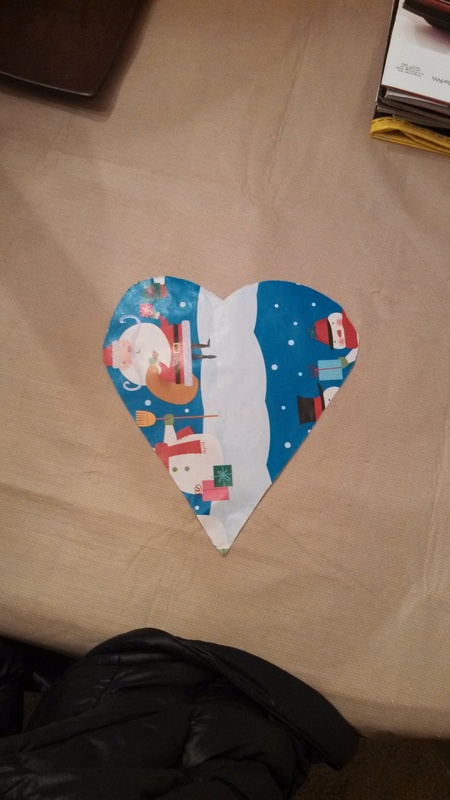 I found that heart of wrapping paper on the dining room table at Zach’s place last week as we cleaned up after the holiday rush. And when I saw it, my heart skipped a beat (insert more romantic jazz here). It was so sweet, and such a small, itty-bitty detail, but I was so glad that instead of roaring through the dining room and throwing everything away, I stopped and took the moment to see what it really was. Zach was so proud of himself for surprising me, and I just loved it. I want to keep looking at this picture and I want to keep reliving that moment because it was just so damn sweet. If I can remember just how happy that little piece of wrapping paper made me, maybe I can figure out a way to let go of the future; I don’t need to control everything that will happen in the next five years in order to enjoy it. In fact, I think it’s quite the opposite. If I let some of the details fall into someone else’s hands, I think I will love the outcome.